Welcome to our stop on the Legacy of the Clockwork Key blog tour hosted by Itching for Books Book Tours. We have our review and there is tour-wide giveaway. When a fire consumes Meg’s home, killing her parents and destroying both her fortune and her future, all she has left is thetarnished pocket watch she rescued from the ashes. But this is no ordinary timepiece. The clock turns out to be a mechanical key—a key that only Meg can use—that unlocks a series of deadly secrets and intricate clues that Meg is compelled to follow. Meg has nothing. No parents. No home. No money. No secure future. She is alone and destitute after her parents die in a fire. What she has left is a fire damaged timepiece and she soon knows there is something very different about this timepiece. When advised to take a position as a maid, Meg doesn't want to give up the life she had but she has to. Legacy of the Clockwork offers readers a wonderful blend of genres from the allure of steampunk-ish machinery, historical details of London, mysteries about her family and a secret group they had links to and the key from the title, and a touch of romance. There is magic and lots of gadgets. Meg is an honorable teen girl, smart, and dedicated once she learns about a group and their sinister plans. There is a young man who befriends Meg and there is a romance though I didn't find their relationship that believable (yet which may change in book two). Meg is more of an innocent sixteen, not worldly and knowing, which made her endearing. As for those machines--they were cool and I wanted to know more about them, how they worked and such. 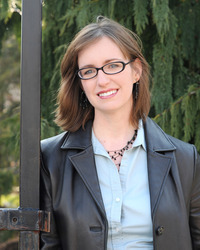 Kristin Bailey's writing style is pleasing and smooth. The opening scene with Meg simply drew me in with its vivid details and the elegant style of writing. As I find myself saying about many first books in a series, I wanted more--more depth of some characters and the machinery--and hopefully I will get more when the next book is published. 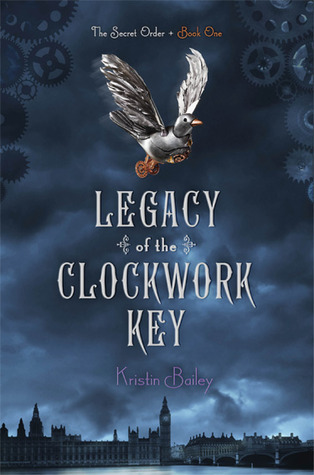 Legacy of the Clockwork Key is the intriguing beginning of a new fantasy series mixing genres and featuring an endearing heroine. This is a world I certainly want to read more of. Cover comment: I like it. The mechanical bird, the dark blue background, the buildings of London and can't forget the gears. Book source: Edelweiss. I received a promotional copy in return for my honest review during a book tour.